The word “dacha” comes from a verb – “dat'” – to give and the noun “dar” – gift. Since many years, receiving a plot of land for personal usage was a great and very much appreciated gift – whether it came from Tsar government or Soviet government. But the way people used that land did differ much in different times. One cannot fully understand Russia without understanding the cultural context behind Russian dacha. First dachas in Russia appeared in the beginning of 18th century under Peter the Great. He wanted his subordinates to stay close to him even on vacations, so he granted them plots of land near St’Petersburg. These plots of land were strategically positioned on the way to Peterhof, Tsar’s residence, so he could always stop and see how his people are spending their free time. In 1803 the famous Russian historian Karamzin wrote that in Summer Moscow gets empty, since people go to dachas. And by the mid 19th century, dachas became a favorite place to rest and to have fun for all aristocrats, who could afford such a pastime. 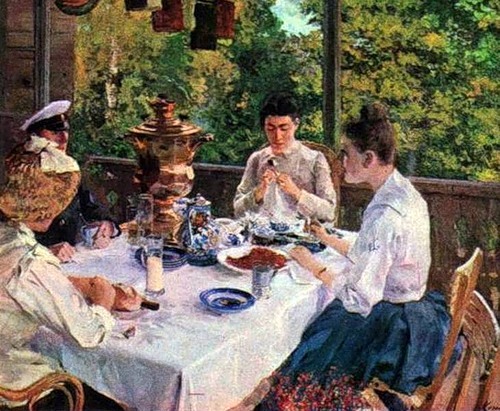 Dachas were often simple wooden houses, but always had a terrace, where the inhabitants could dine, drink tea and entertain in the long summer evenings. Not all people owned dachas, some did rent them for summer and usually traveled to dacha together with an entire family and servants. Read Anton Chekhov if you want to learn more about dacha stories of that time! October Revolution of 1917 brought with it a law, which forbid private ownership of land in Russia “forever”. The idea behind it was that all citizens of the country will be able to use all the country resources, all people will be equal and none would be able to exploit other people or be more rich than they are. The new Soviet Republic values were mainly collectivistic. 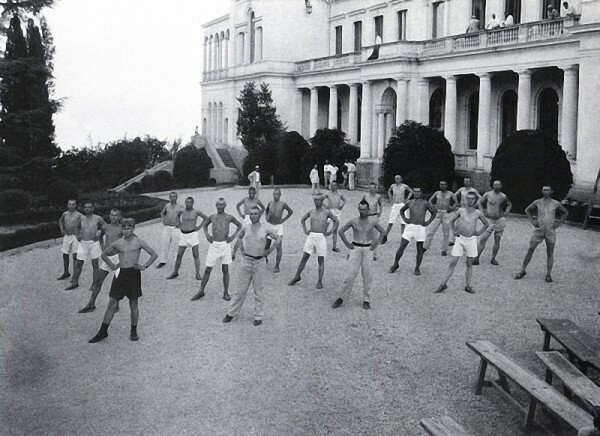 And instead of individually owned dachas, general population got access to group recreational facilities such as sanatoriums. A popular Soviet phrase was: “All around me belongs to the people, all around me belongs to me”. There was however another saying – “everybody is equal, but some are more equal than others”. Josef Stalin, who ruled the country from 1924 till 1953, was fond of a good countryside recreation himself. He had many dachas in the most picturesque parts of Russia – from Moscow region to the Black Sea. These were huge mansions, fully staffed and ready to welcome him any time he decides to show up. Stalin figured that granting such privilege as summer dacha to his closest people in the government and to the VIP people from culture and science élite will be very motivating for them. These dachas did not belong to their inhabitants, furniture and lamps had itinerary numbers on them, but these dachas were a big luxury and getting one was considered to be a huge privilege. 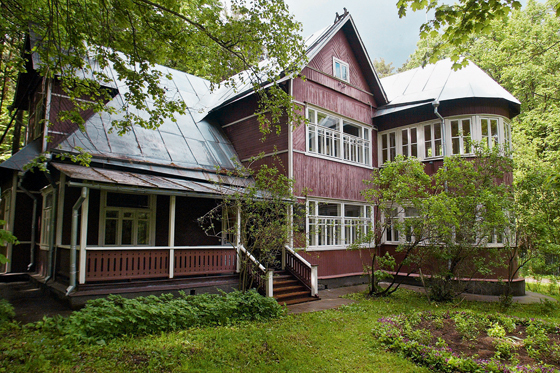 To simplify things – dachas were grouped by the occupation – that is how we still have “villages” of writers, composers, artists, scientists etc. At that time all dachas were a place to rest, fish, collect berries and mushrooms, play sports and entertain with friends. After the WW II, limited food resources in the country forced government to allow people to get plots of land and support families by growing veggies there. However, building a house on that plot was strictly forbidden. In the 60s, during Nikita Khrushchev’s time at power – ordinary people were finally allowed to get dachas. But it was so not easy to get one. Distribution was merit-based, one needed to fully comply with the ideology and wait in a long line, sometimes for many years. These dachas were not as luxurious – it was usually just a tiny plot of land with a permission to build a small one-floor house there. Inhabitants still did not own it, but could use it for growing produce strictly for family consumption (not for sale). 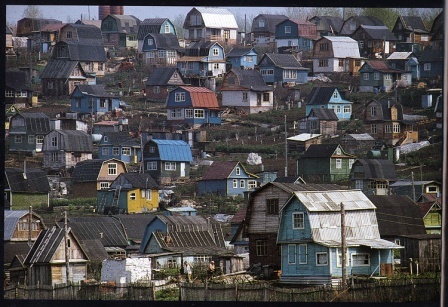 Still, people felt as if it was their own land, so getting a dacha became one the dreams of Soviet people, in the same line as getting an apartment or a car. There were many manipulations – how to get dacha quicker. In Russia law and rules were always particularistic, so if you knew somebody, you could get to the desired dacha much quicker. Building a house was not easy as well. There was a deficit of construction materials. It is difficult to imagine that now, but one could not just go to a store and buy wood or bricks or anything else, one needed to “get” the needed materials somehow through his network of contacts or pay triple at the black market. This was the time when the function of dacha started to morph – it became a place of hard work in the field rather than a place to rest and entertain. That function of dacha came in very handy in the turbulent times of the 90s, when food was scarce in the stores and people really supported their families by growing potatoes, cucumbers, fresh produce, berries and apples at their land. 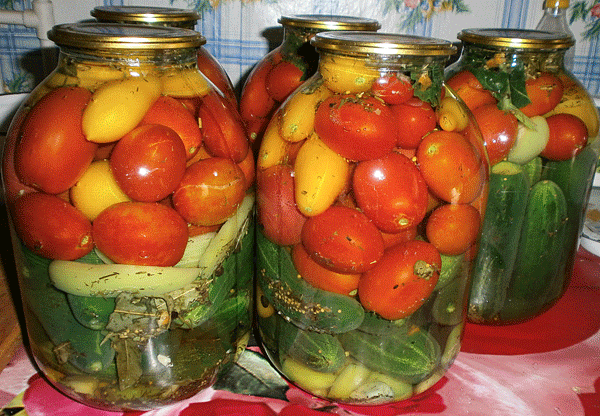 A lot of home-grown produce was conserved for winter in either pickled or salted form or as home-made jams. In the 90s was finally allowed to own property. That is another big and interesting story, but the outcome was that people started to buy dachas if they had money. Or, if they already had dachas, they could privatize them, officially making them the owned properties. Restrictions on the size of the land or number of floors in the house were also lifted. Finally, you could do whatever you want at your own land. Curious what happened next? People, who were always deprived of such array of choices started to experiment. 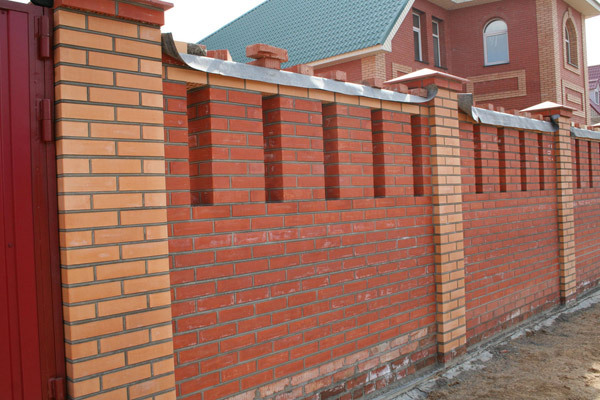 Rich “New Russians” immediately started to build huge mansions at their small plots of land. A lot of these houses lacked taste or style. Generations of local people had not seen beautiful country houses and commercial industry in this area was not developed yet. Tradition of building wooden houses was replaced by building brick or stone ones. Dachas used to be just summer houses, but now many people started to build all year round houses. Now, finally, the industry works as well as in any other country and if you want to build a beautiful house of any style – it will be built for you. But it will be pricey. As with any commercial goods and services in Russia – from clothes to manicures, you pay premium for good stuff! So, how do people spend time at dachas now? That does vary. A lot of people still work all day, growing potatoes, cucumbers, strawberries etc. The majority of these people have full-time jobs in the city, they are not agricultural workers, but every Friday evening they leave the city to have a weekend of really hard work in the field. Needless to say – they have to cope with huge traffic jams on the way to dacha and back. Sometimes getting to a dacha which is 50-100 km from the city can take 3-4 hours. It is not possible to give a rational explanation of why they still continue growing potatoes, although they can easily buy them in any store. Economically it does not make sense, but people are irrational. For some growing produce is a habit, some (mostly older people) enjoy to cultivate land with their own hands, some like the idea of organic produce or say that potatoes, grown in your own garden just taste better. Another phenomena, which we, locals, call “Balcony, dacha, garbage can“. It is a story of frugality, caused by deficit of things in stores during Soviet times and scarcity of storage areas in urban apartments. Russians do not like to throw things away,even if they do not need some things – they still keep them. This stuff first lands at the balcony, then moves to dacha and only if it is really old or completely broken, ends up in garbage. As a result of that, a lot of people wear old clothes at dacha. And the majority have stacks of old clothes at dachas even though there is no shortage of clothes in store any more. 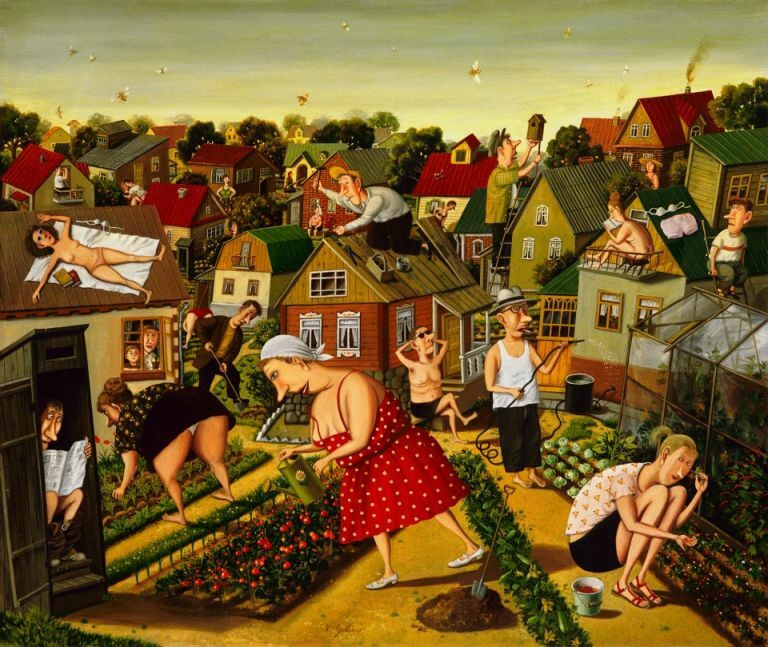 Still, many people do think of dacha as place to have fun. These people mow their lawns and plant flowers, so they still have to do their share of field work to make their dacha look presentable. But instead of spending all time in the garden, they invite friends and entertain them, grill meat, eat strawberries sitting in gazebos, play sports and enjoy other recreational activities. Hopefully this will become a mass trend and more people will enjoy resting at dacha rather than working there! I wish we return to Chekhov’s times and will see Russian Vogue publishing dacha’s couture section each summer. My ideal dacha is a place where people wear beautiful dresses, eat strawberries sitting in reclining chairs, while reading a book during the day and entertain friends in the evening! I want us to play charades or music, engage in sports, long walks at the picturesque areas, collect berries and mushrooms in the forest just for fun and enjoy all that! And I wish the problem of traffic to be solved somehow! That would be an “ideal dacha”! ← How to Entertain Yourself in Moscow Traffic Jams? Thank you very, very much for you lovely, wonderful information and stories about the Dacha’s. 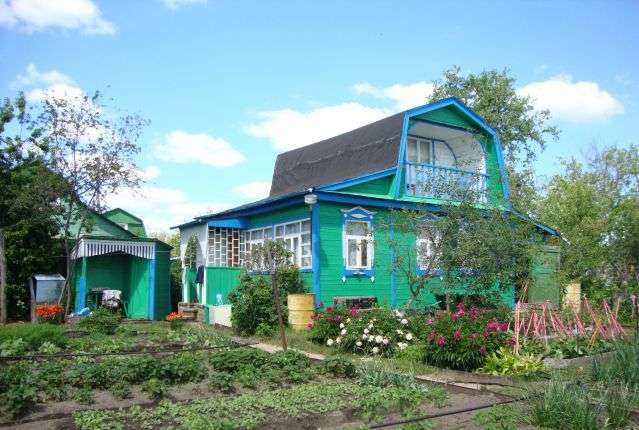 The history of Dacha which you have described is absolutely fascinating. Your photographs and images are superb. The narrative of your last paragraph was so beautifully described, I felt almost transported to such a scene. I have learned (and still learn) a great deal about Russian culture from you and your lovely website. I enjoy reading your narrative so very, very much. If you ever wrote a book please let me know as I will be the very first to buy! Once again, thank you for taking the time and energy to explain this important part of Russian culture and life. I am very grateful to you. All kindness and best wishes to you. And, btw, your blog is not lovely, it is kitsch, pure and simple. Hmm… I was surprised with your opinion. This blog is really free of politics, at least how I see it. I regret that you do not like it. Maybe you could offer better topics to write about? I am always listening to a feedback of my readers. As for the post about dachas – I did a lot of research and just wanted to show the ways people obtained dachas (dachas were common, that is true, but not easy to get). In the About this blog section I have a disclaimer though, that I am not a specialist on these topics, this is an insider’s view and I do not pretend it is 100% correct. Please feel free to provide opposing opinions, facts etc. Brilliant article, really really interesting. We have something a bit similar in Finland, summer cottages: http://www.visitfinland.com/article/the-essentials-of-cottage-life/ or maybe dachas should be compared to the allotments we also have in Finland, not sure. Allotment buidlings are a lot smaller though. Cottages are small or big wooden houses, preferably by a lake (which we have thousands in Finland) where people go to relax; reading books, bathing, fishing – and sauna being an extremely important part of cottage life here, of course:). 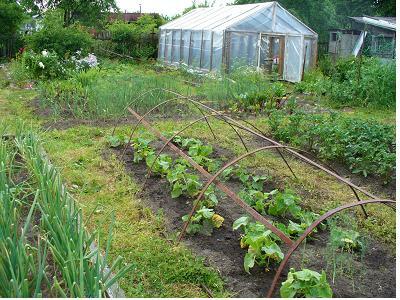 Allotments are more urban, small houses with small gardens where the gardening and growing veggies etc. is the most important part. Can’t wait to read more about our eastern neighbours in your blog! Greetings from Canada, What a charming and informative blog! I’m so happy I discovered it while searching for information on the dacha and its history. And I did not find it “political” at all. That was a curious comment for someone to make. Everyone writes about their home country with their own perspective, without judging. I’m always fascinated by Russian culture, especially literature and MUSIC above all. The question I have is why do the newer dacha communities seem such a short trip from the big cities? Is it more a psychological trip than one of miles? Thank you. Thank you so much for your very informative and delightful blog, Tanya. Yours is an example of the very BEST of what the internet has to offer: a true view of other lives in places i could not understand any other way. You inspire me.